Many of these photographs were taken between 1973-1980 when it was still ok to bring your camera to a concert. Today I am using a Nikon D90 and D300 for the recent outdoor photos, and a Canon G9 for the recent indoor pictures. The Hardly Strictly Bluegrass Festival in Golden Gate Park in San Francisco is a great place to photograph music as there aren't any restrictions on photography. Many, if not most, of the venues where these were taken no longer exist. Winterland, The Old Waldorf, The Boarding House, and The Circle Star Theater are long gone, unfortunately. The 2010 Hardly Strictly Bluegrass Festival in Golden Gate Park was another outstanding collection of musical artists. The crowds were again gigantic, and it was first come, first served as far as seeing anyone up close. I got lucky for the most part and I was happy with the results. It's work though. This past weekend, the 23rd and 24th of October, 2010, was the 24th annual Bridge School Concert, held at Shoreline Amphitheatre in Mountain View, California, a scant 4 miles from my house. I was able to attend both days, taking my son on Saturday and my wife on Sunday. Despite the incessant but fairly light rain, it was the best of the many I have attended over the years. The highlight for me and many other fans was the reunion, after a 40 year hiatus, of the great Buffalo Springfield. Since October, I have seen a few shows but mostly added some 200 slides I had scanned. There are acts that I don't remember seeing, much less where I saw them. (Hall and Oates for example, or the Flying Burrito Brothers) Nonetheless, I found some good shots of Queen, ELO, Thin Lizzy, and more. It looks as if the "no cameras" policy took effect sometime in 1980 since after a certain date, there are no pictures...and I know I continued to go to concerts. There are also some new Eric Clapton shots taken the first week of March, using my trusty Canon G9. Noisy but cool anyhow. Lately, (September 2011) I have got aound to scanning about 250 slides from two Who shows, 1976 Winterland and 1980 Oakland Coliseum. I've added a number of these shots. The latest shots were taken at the recent MUSE Concert, Sunday August 7th at Shoreline Amphitheater in Mountain View. The Canon G9 and Sony HX5 were used. Some new shots are about to be added, including Roger Daltrey and his amazing band, featuring Simon Townsend, performing "Tommy" in its entirety, along with another hour plus of vintage Who material. This took place October 21st at the San Jose Civic Auditorium. They did a remarkable job of recreating this difficult material, especially the six part harmonies. Just yesterday, two days after the "Tommy" gig, I went to the Bridge Benefit Concert at Shoreline Amphitheater in Mountain View. Performers included Nora Jones and the Little Willies, Beck, Carlos Santana, The Foo Fighters, Mumford and Sons, Dave Matthews, Tony Bennett, Eddie Vedder, Arcade Fire, and Neil Young. What a lineup! On February 4th, my wife and two friends went to the venerable Fillmore Auditorium in San Francisco to see the Jayhawks. I brought my newest toy, the Sony NEX5n, to see what concert photography would look like with this camera. It's the size of a point-and shoot with the image quality and low-light performance of the best DSLRs out there. In fact, I put the camera body in my back jeans pocket and the 18-55 lens in my fleece sweat shirt and walked right in. No hassles from the staff cuz' it looks like a point-and shoot or an Iphone. Just astonishing quality in my book. More recently, on April 19th, 2012, my friend George and I went to the Fillmore in San Francisco to see Squeeze, a big favorite of ours. Again, I was able to get the little Sony into the venue but not as easily this time. There were a few hassles with the staff but I was able to get some nice shots of the band. In October of 2012, I saw two shows: Joe Jackson's new band at the Montalvo Garden Theater touring behind his new album, "The Duke," and a great double-header in San Francisco with Mark Knopfler and Bob Dylan. On December 15th, 2012, my friend Matt and I took in the Graham Parker and the Rumour show at the venerable Catalyst, in Santa Cruz. One of the best places in the Bay Area to see live music for sure. Small, fairly narrow, tables and chairs for this show attended mainly by men of a certain age who remember GP and the band from a string of great albums in the mid to late 70's. This short tour was their first time back together since 1980, and they have lost very little from those days. All band members are in their 60's now, but still have the requisite energy and musical chops to pull this off. My personal music highlight from 2012. Last Saturday night, December 14th, 2013, my friends George, Matt, Jerry and I saw the Dave Mason concert at the Rio Theater in Santa Cruz. Dave Mason has been a favorite of mine since the days of Traffic, circa 1967, and then when he released his first solo album, Alone Together, one of my 10 Desert Island discs. He did a nice show, the guitar and voice still unravaged by the passing of time, but his takes on Traffic songs, most of which he didn't originally sing on, were less successful. Worth the trip over the hill anyhow. 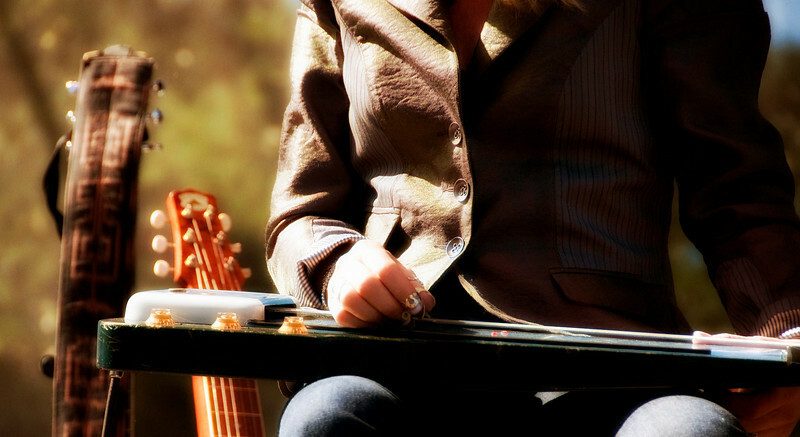 Chris, The shot taken of Cindy Cashdollar is with a non-pedal steel guitar.